The berries mightly expel the wind and provoke urine, help the mother, and kill the worms. The leaves also work the like effects. Bay grows in woodland areas and prefers warm climates like the Mediterranean. It blooms in mid to late spring. In areas that have more than just the occasional frost it is probably wise to attempt to grow this perennial in a pot, placed in a sunny location and brought into a cool bright area in the winter. It can be propagated byseed,cuttings or layering in any kind of soil. It is a tree that can be trimmed to a desired shape. Astrology: Bay is a tree of the Sun under the celestial sign of Leo. 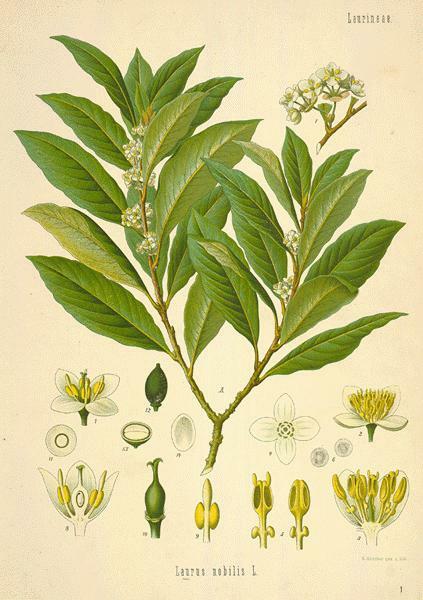 Medicinal Uses: An oil of Bay leaves is very good to use externally on areas affected by rheumatism. The oil is also good when used on bruises, damaged muscile, where the skin has not been broke, and as an anodyne for earache. and quickening of the pulse. Folklore: Bay has a history of use in attracting love, this may be done by burning the leaves or by using the oil to annoint a candle which is then lit for meditation. It holds prominence among the Greeks who used it to show honor for the victorious athletes and was a religious herb of the preistesses at Delphi, where they chewed them as they proclaimed their insight andvisions. (THIS IS NOT RECOMMENDED!) A current practice is to make a wish box, decorated and constructed with bay leaves inside and given to a friend. The friend may thenmake a wish during the course of the waxing moon.It is said that this tree will protect one from thunderstorms, probably due to its association with Apollo, in his apect as player of the lute. Bay may be used ritually to invoke Apollo. For the Tarot reader or student bay may aid in the understanding of the Sun card.